Living a Fit and Full Life: Get to Know Andalou Naturals New CannaCell Skincare Line! Get to Know Andalou Naturals New CannaCell Skincare Line! 100% of the net proceeds from our A Path of Light Hand Creams supports education, equality and empowerment worldwide providing the next generation of young women leaders with grants to SHE-CAN Scholarships and Vital Voices Global Partnership.The meaning of Andalou is ‘Path of Light’ and we believe it best reflects our intention to foster good things in the world and enrich the lives we touch one responsible product at a time. Discover your pure, natural beauty with this deeply nourishing botanical facial cream with CannaCell® hemp stem cells, organic hemp seed oil, and pure plant essential oils for a complexion that glows. Get to know Andalou Naturals new CannaCell Skincare Line! I've heard wonderful things about Andalou Naturals for quite awhile now so I was thrilled to check out their new CannaCell Skincare Line. I had the pleasure of trying the products above and I'm incredibly impressed! 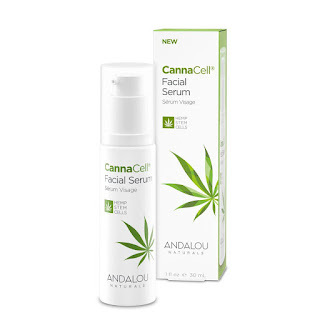 Andalou Naturals' CannaCell® Facial Serum is an amazing facial serum! It's a nourishing botanical facial serum with CannaCell® hemp stem cells, organic hemp seed oil, and pure plant essential oils that will give you a radiant glow to love. I also love that it's made with bioavailable vegan ingredients that are gentle and effective. This serum is perfect for all skin types and works wonders to calm and hydrate skin! 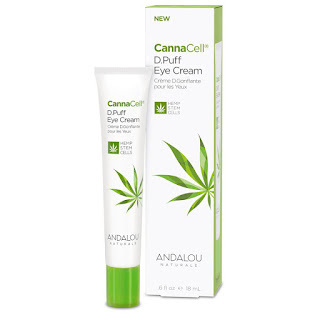 CannaCell® D.Puff Eye Cream from Andalou Naturals is the perfect eye cream! It's a botanical eye cream with CannaCell® hemp stem cells, and organic hemp seed oil. It gives the eye area a plumper, smoother and brighter appearance that will have you looking well rested and ready for the day. CannaCell® Happy Day Cream from Andalou Naturals is a terrific day cream for all skin types! It's a nourishing botanical day cream with CannaCell® hemp stem cells, organic hemp seed oil, and pure plant essential oils that gives you a beautiful complexion. It's incredibly hydrating and seems to calm my skin on contact. I also love how soft and smooth it makes my skin. It's an awesome day cream! Andalou Naturals' CannaCell® Dreamy Night Cream might just be my new favorite night cream! It's a deeply nourishing botanical facial cream with CannaCell® hemp stem cells, organic hemp seed oil, and pure plant essential oils for glowing complexion. It's incredibly hydrating, absorbs quickly and heals and restores my skin come morning time. It's an amazing night cream that I've fallen in love with! Andalou Naturals new CannaCell Skincare Line is simply amazing and a must try! Click HERE to find a store near you that sells Andalou Naturals! Click HERE to learn more about Andalou Naturals! Follow Andalou Naturals on social media!